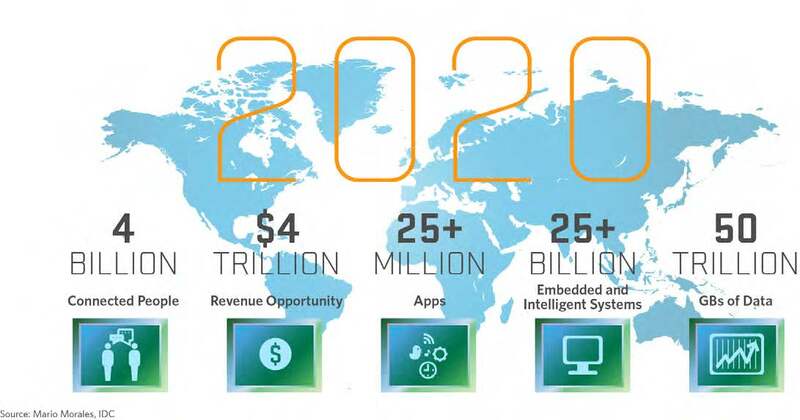 The “Internet of Things”, (IoT) is the next logical wave of computerization. The role of What If What Next is to provide leadership during the early implementation phase of new products that exploit the advantages of IoT. The “Internet of Things” allows mundane, ordinary devices to communicate. If there are many types of devices and a wide spectrum of data, then it is possible to create services with emergent behavior that surpasses the capabilities of the individual constituent parts. However, like the early waves of computerization, there are too many degrees of freedom when building out with this technology. Mistakes can be made that slow adoption and cause companies to fail. If we consider the first wave to be the introduction of mainframe computers, then recall that IBM was the one dominant player. They made all the design decisions and held them internally resulting in reasonable (but expensive) usability. The second wave was the commoditized home PC. Here there were hundreds of competing component manufacturers loosely adhering to a vague interfacing standard. We all remember how unstable the early IBM clones were. It took a decade for the components market to consolidate. Similarly, the following waves of Internet computer connectivity and personal mobile device adoption each had teething pains as we struggled with incompatible networking protocols and duplicated ‘App’ implementations within the IOS/Android space. The new IoT wave also faces a crisis of too many independent implementations. In this case it is not the hardware that will be the problem, it is the short term thinking that decides what raw information will be harvested and what proprietary formats will be chosen for these newly connected devices. It will be very tempting for the early players to build very specific solutions that tightly couple these two components. The problem is that the service/mobile design will continue to evolve as the end users learn what they can do with this data and demand new features requiring more information. By limiting the data collected in the electronics/software design, then much of this infrastructure will become obsolete and require expensive replacement as broad user applications emerge. This will lock out the early vendors and cause them to fail. This is where What If What Next will lead. It will be our mandate to define broad data collection standards and publish hardware and software designs for connecting these devices to the Internet. We will offer and broker consulting services. We will also be a repository of the emergent high-level system design concepts that form the new connected applications of the next decade. As a forum for design ideas and system level thinking we will help the builders create solutions for the long term. We seek to establish a healthy long term market for many players in this space rather than a see a consolidation of a single proprietary solution that results in the closure of early entrants. This is the way to maximize the return on investment in the IoT space.